Lemon grass, Cymbopogon citratus and Cymbopogon flexuosus, is an unusual tropical grass as an essential flavoring in South East Asian cooking. Its bright lemony scent is used in drinks, curries and soups. It is delicious in tea with cloves. It's rich in vitamin A. Its oil also has many industrial and medicinal uses. Lemon grass is native to India, Sri Lanka, Malaysia and Indonesia. C. citratus is referred to as West Indian, C. flexuosus as East Indian, Cochin or Malabar. Other common names are fever grass or citronella grass. There are over 50 species in the genus. Both of the common species are fast growing perennials that grow to 3 to 6 feet tall and 3 feet wide. They have long, light green leaves and inconspicuous flowers. Lemon grass is hardy in zones 9-11. In other areas it is grown as an annual or brought indoors over the winter. Grow in a frost-free place in full sun or light shade. The herb likes moist, well-drained soil that is slightly acidic. It grows best in warm, humid conditions. It can also be grown in a container or in the greenhouse. If you move your plant outdoors for the summer, allow it to acclimatize over a number of days, first placing it in shade, then moving it to part shade before giving it full sun. The plant can be grown from seed or division. The many varieties available, mostly used in commercial cultivation, do not come true from seed, and seeds germinate slowly, so vegetative propagation is usually preferred. Lift and cut apart clumps in early spring or fall. Space 3 feet apart. 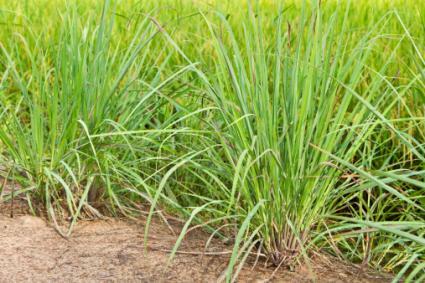 Lemon grass is clump forming and does not runner and become invasive like some grasses. Water regularly in summer. Lemon grass gives a tropical feel to the garden. Plant it with other herbs, or near large leaved plants like castor bean and canna lily. It can also be used to as a backdrop in the perennial bed or to form a border to separate areas of the garden. In cooking the bulbous stem is cut in to sections and cooked in the dish, then usually removed before serving because it is tough and fibrous. 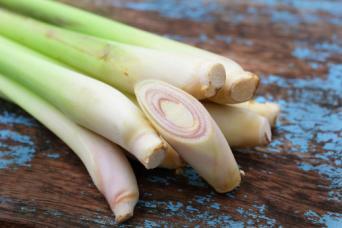 The soft inner part of the stem is sometimes finely sliced and added to soup. The oil is used in perfume, makeup, soap, hair products, cleaner, antifungal agents, incense, and potpourri. It is also an effective and non-toxic insect repellent. It is used in aromatherapy. Some gardeners have reported skin rashes when handling the plant.